It feels like time to get these circles moving. I'm still basting and sewing the individual units but want to get more of a feel for how they are going to go together. I have sewn together this chunk. I liked the way the lettered strips looked en masse in the photos I took, so, although I originally envisaged using them singly, I'm now going to layer them up deliberately, just as long as it fits with the circle blocks. I don't intend to go causing myself too many problems fitting this all together. Now I''m laying out options for the next bit. I like the third row better here than with the offset circle, and the purple strip down the left hand side may get a friend or two, but nothing more has been stitched so I can keep on tinkering for a bit. I'm going to link up today with Em's Scrapbag for Moving it Forward Monday. I love the way this is coming together. It's so cheerful. This layout does look better than the staggered ones. This is beautiful. This is coming along nicely. Gorgeous! Fascinating to see how you are putting this together. Your varied circle sizes are wonderful. Oh, hey! This is coming along really neat! I love the play of the stripes and the circles, and yes - the lettered strips are perfect layered up in there. Beautifully graphic feel to these circles!! Just simply wonderful, I love this so much!! This just seems like the natural setting for your blocks! You're doing a great bit of work on this. Very creative way to set the circles. So creative. A simple concept- the circle repeated 365 times- can go so many directions. Ooh, I like this! I came to see how the jacket looked and got diverted. Colours are fab and it reminds me of the planets. It is beautiful, best I have seen, to me. Loving it. This is lovely. I'm a big fan of dots, and I really like how you're using them. You got me, girl! I'm in! This post was the deciding factor. 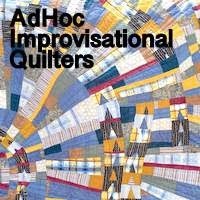 I posted about it today (http://fleurdelisquilts.blogspot.com/2016/02/quilty-365-beginnings.html) and mentioned you in the post--I had to thank you!